Home > Blog > I think I was wrongfully terminated? What now? 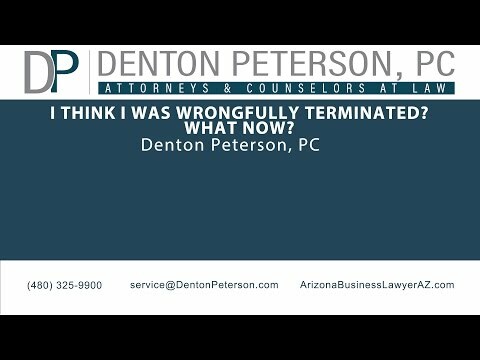 If you have been fired from your job, how do you know if the termination was legal or illegal? An illegal firing is called a wrongful termination. In Arizona, most employment is “at will,” which means an employee may be fired at any time for any reason with a few exceptions. These exceptions are in place to prevent employers from firing people for discriminatory reasons. These exceptions are not outlined in any one law but are spread out through many employment laws both locally and nationally. If you believe that you have lost your job for an unlawful reason, you may have a right to bring a claim for wrongful termination against your former employer. Legal remedies that may be available to you include money damages and, if you have not been officially released yet, negotiation for an appropriate severance package that includes adequate compensation. Firing in retaliation for the employee having filed a complaint or claim against the employer. State laws may mirror these categories of protections and may also expand on them. Given that some employers do actually wrongfully discharge employees, it is a good idea for a terminated employee to retain counsel. An experienced Mesa business attorney can help sort out the various issues and protect your rights and your reputation. After being fired there are a few things that you can do to help your case. First, you need to remember to not do anything rash or bitter towards your employer. Acting out in anger can complicate any legal claim you may have. Return all company property and follow any other common post-employment procedures. Next, you should write down all the circumstances of your termination while they are fresh in your mind. Creating a timeline of events will likely be helpful. Note when you were notified and also when you were asked to leave. It is a good idea to gather as much information as possible. Ask why you were fired, find out whose decision it was to fire you, keep a copy of your termination notice if you receive written notice, and ask to see your personnel file. Be sure to document the names of everyone involved. Collect your pay stubs so that a calculation of your damages can be made. Finally, make all of this information and documentation available to your attorney. If your former employer offers you a severance package, avoid signing it right away. You need time to review the offer, have your attorney review the offer, and negotiate the offer. An employer is not required to give severance pay to an employee unless an employment contract requires it, or the employee handbook or manual indicates that the employer has a policy of doing so. However, an employee may be able to negotiate a severance package in exchange for a promise to waive any legal claims against the employer. An attorney can explain your options and advise you as to whether a severance package or a wrongful termination claim will make more sense in your situation. Getting fired can be embarrassing and stressful. Do not allow yourself to be intimidated and do not lose your cool. Your next steps can make all the difference in receiving fair compensation. Gather all of the information you can, delay signing anything, and contact your attorney as soon as possible.